I remember going through the fellowship process and having little guidance as to what fellowships exist and where to find them. The two main types of fellowships (APMA/CPME and ACFAS) are listed below. However, PMNews has a tendency to post fellowship positions that are not listed on either of these resources so checking this come time for applying would be helpful. A helpful resource is to contact the program and speak to current/past fellows to get an idea of the program. Most do not allow you to visit until you submit the required application items and are then granted an interview. The process of applying should start the spring of your PGY-3 year and you should start to arrange your items a few months before to be prepared. Common items required are current CV, Letters of Recommendation (director, attendings, orthopedic attending), and logs. The Student Doctor Network website has a newer forum on this topic (“Official SDN Podiatry Fellowships Review Thread”) created in November 2016. Reviewers discuss their experience to offer program transparency for future applicants. The information here can be helpful in gaining an idea about the program. Otherwise, speaking to others who have applied/visited a program you are interested, or past fellows, is the next best way to find out about the program. My experience, co-applicants and past fellows are often open and friendly to discuss their experience. 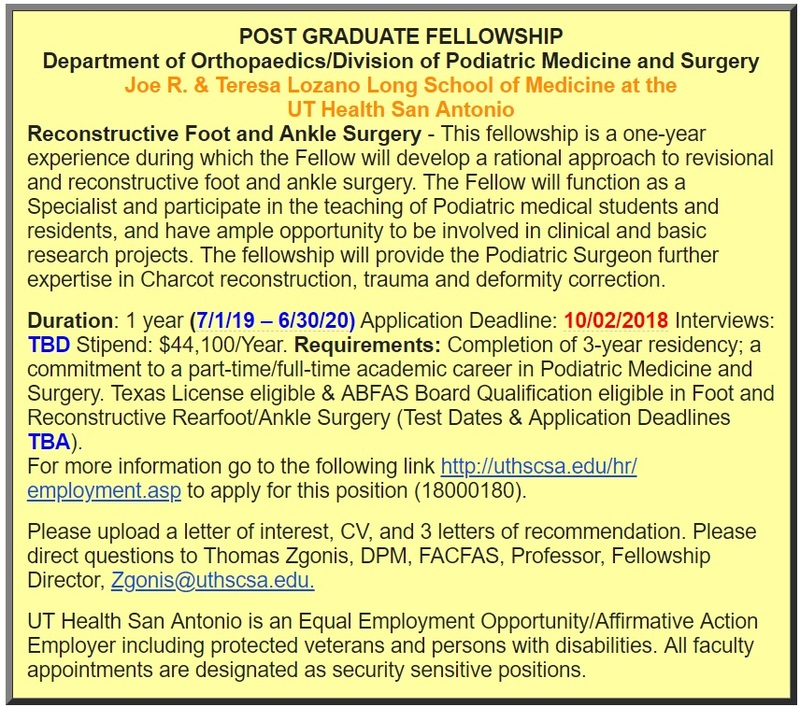 There is also a new thread on SDN about the "Current state of podiatry fellowships..."
This fellowship list has been accumulated from various sources like PMnews emails, Podiatry Management listings, and my own research. Please contact to see if they are still available. International Mission Podiatric Surgery and Medicine Fellowship - Patrick DeHeer, DPM. Indianapolis IN. Ohio ID/Wound Care Fellowship - contact Deborah Mott for information. Research different fellowship programs and start to decide where you would like to go. This could be geographically or program specific reasons. Create a spreadsheet organizing due dates and application requirements for each program. This part is key as there is no standardized process for the application. Due dates range from as early as April of PGY-2 to December of PGY-3, all for the same matriculation/fellowship year. Reach out to the program to see what specific items they require for the application. The websites above give general guidelines and/or are incomplete so its better to ask ahead of time versus scrambling around last minute to procure needed items. Organize your application. Items you will need commonly include: (1) CV/Resume, (2) 2-3 Letters of Recommendation (ask the program who they need to be from - usually director and 1-2 attendings, sometimes a LOR from an Orthopedic attending is required), (3) Updated Logs (ask what format they would like them in). Schedule the visit. Try to schedule visits in July-August and to be done them by October at the latest. Though an application may say the deadline is for ex. December (and you plan to visit in November), they often make decisions before this deadline. Visit dates will be somewhat dictated by the due date and when the program would like to lock down a fellow. Expect a visit to be 1-2 days and can consist of being in the OR (observing) and/or clinic. If associated with a residency, you may attend their academics and meet the residents. Create a list of questions. Each fellowship is very different with their rules and procedures. Academic = case load and types/variety, clinic/office hours, fellow-run clinic, call hours/schedule, resident-related duties (if associated with a residency program), academic duties, research requirements. Social = stipend (on application), benefits (malpractice insurance, health insurance, license reimbursement, ACFAS membership), CME, vacation, conferences, where to live, how the area is. Reach out. If you know ahead of time of a program you are interested in, make sure to reach out to the current fellow or past fellows. Have questions ready. Conferences. See if the director or fellow is attending an upcoming conference you will be going to and try to seek them out even for a few minutes to introduce yourself. Fellow as a resource. Everyone I encountered through the process was extremely helpful and accommodating. I found it no problem asking the fellow of a program where else the visited, their thoughts, if they could put you in touch with anyone (current/past fellow) at another program. Other applicants as a resource. You may know other people who have or are going through the application process. Ask them impressions of a program and give them honest impressions of places you have visited. Try to combine trips geographically if able to help your schedule. The visit isn't that stressful. Be calm. The fellowship "interview" is very laid back unlike residency. The bulk of it is social. You will be spending a lot of side-by-side time with the director and they want someone they can stand being around for 1 year intimately and feel like they can trust to be given a lot of responsibility in treating their patients. Things you may be asked range from residency related (how your program treats a pathology (if in the OR), what kind of cases your program does, your residency experience, what you're looking to get out of fellowship, etc) to social (family, what like to do for fun, sports, interest, etc).